Even if he had to do it alone, cyclist Jim Cullimore was ensuing that the territory’s premier race, the 44 miles Tour de Tortola would live on. On Sunday, he was joined by Philippe Leroy, Laurens Block and Dennis Veroza, in circumnavigating the island, starting on Beef Island. 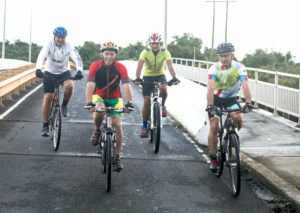 While there has been no BVI Cycling Federation organized events in the last few years, Cullimore said one major race he can’t miss doing was the tour. While Cullimore acknowledged that people weren’t fit but if they had done the tour before they could have done it again. Why was it important for him to be able to continue doing the Tour de Tortola? Cullimore, a former BVI Cycling Federation president said it’s his passion for the sport that keeps him going adding that it’s very demanding. When asked where he’d like to see cycling which in its heyday had monthly races and hosted the 2006 Caribbean Cycling Championships, Cullimore said like other sporting organizations the executives are volunteers, but most people feel that cycling is too much effort. With several stops along the route, the quartet completed Sunday’s tour in 4 hours in 23 minutes, though Cullimore whose best is 3 hours and 07 minutes wanted to break four hours.